Hurt by a policy logjam, high interest rates and global headwinds, India’s GDP growth for the second quarter (June-September) of this fiscal slumped to 6.9 per cent, the weakest in two years, as analysts and industry expressed apprehension there was nothing on the horizon to indicate an improvement in subsequent quarters. The Indian rupee suffered the worst fall in 16 years in November, plunging nearly 7% and hitting a record low, as persistent dollar demand from importers and portfolio outflows due to global risk aversion pounded the local unit. A solution to the dispute between the telecom operators of the country and the department of telecommunications (DoT) over the 3G roaming pacts does not seem to be in sight. The Supreme Court has reprimanded former stockbrokers Ketan V Parekh and Kartik K Parekh for virtually projecting themselves as beggars in a bid to avoid paying penalty imposed by the enforcement directorate in a money laundering case. Japanese auto major Honda Motor Co is focussing on development of diesel engines and small compact cars in order to meet specific demands from the Indian market. 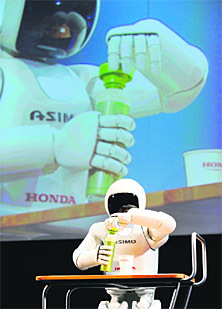 "We’re aware of the petrol price increase in India but we consider that as a sign of growth in the Indian market... definitely we are currently developing diesel engine cars," Honda R&D Co (automobile R&D center) managing officer, chief officer (development operations) Yasuhisa Arai told PTI. Having become the fastest-growing premium car brand in India and the second largest selling car in the world, having overtaken competitor Mercedes Benz, Audi is looking to expand its footprint in Punjab with it being one of the fastest growing markets for Audi India . Having lost its position as the top player in the desktop PC segment, computer hardware maker Acer India is going all out to recapture its position in the Indian market. With the firm looking at higher sales through various government run programmes in the coming month, it hopes to regain its place at the top. Auto major Tata Motors has pipped giants like Reliance Industries and Infosys to become India's top-ranked company for research and development, according to a list compiled by the European Commission. Japanese small car major Suzuki Motor Corp is considering plans to launch electric vehicles in India, although it sees infrastructure as a big challenge. IT firm Cognizant has inked a multiyear agreement with pharma major AstraZeneca to deliver comprehensive biostatistics and medical reporting services for generating clinical study reports. The only consolation was that the figure was in line with market estimates and did not come as a rude shock. The number compares with a 8.4 % expansion in the same period last year due to poor performance of the manufacturing, farm and mining sectors. Reacting to the figures, Finance Minister Pranab Mukherjee said though growth was low as seen by the recent trends, given the current global context and the slowdown in the domestic industrial sector, the number was “not all that disappointing”. He said the main reason for decline in GDP growth was slowdown in industrial growth, in particular in investments. The negative growth in the mining sector along with a slowdown in construction also contributed to the decline in the Q2 GDP growth. "Taking into account the trend of the last two quarters, I expect GDP growth to be 7.3% (in 2011-12)," he said. He expressed the hope that that going forward the economy will recover some of the loss in growth momentum. On the fiscal deficit, he said the government is committed to its indicated fiscal balance for the year 2011-12. With the latest figures the GDP growth during first-half of FY12 stands at 7.3 per cent as compared to 8.6 per cent in the same period last year. During the three-month period ending September 30, 2011, growth in the manufacturing sector dipped to a meagre 2.7% from 7.8% in the same period of 2010-11. Farm output also exhibited a similar trend and expanded by only 3.2% during the quarter under review, compared to 5.4% growth in the same period last fiscal. Apex industry bodies expressed their concern on the figures. CII director general Chandrajit Banerjee said the chamber was extremely concerned about the direction of the economic growth trajectory. He pointed out a significant pulldown in investments was apparent and this could take the overall economy down further, since there were very few developments in the country which could be termed as confidence boosters. Given the widely expressed view that the current slump is induced by global events, CII seemed to have a different prescription. It stressed that exports are holding up in the face of an adverse global situation and the current situation of the Indian economy is induced largely by domestic issues and therefore, the corrective actions are very much in the hands of domestic policy makers. FICCI secretary general, Rajiv Kumar said if the current trends were any indication, the chamber estimated GDP growth in the current fiscal would be in the range of 7-7.1% with significant downside risks. FICCI believes going forward, 2012-13 GDP growth was unlikely to be significantly better with prospects of a global economic meltdown looming large. Crisil estimates the prospects for improvement in GDP growth in the rest of FY 2012 remain bleak due to the worsening global scenario, lagged impact of past interest rate hikes on demand and slow decision-making in government. Hence, it is revising its FY12 GDP growth forecast downward from 7.6%. Attributing the decline in Q2 GDP to slow down in investment, the Planning Commission said Wednesday the economy would rebound during Jan-March but the growth rate this fiscal would be 7-7.5%. "My expectation is it (GDP growth) may end up being about the same in third quarter (October-Dec) and perhaps in Q4 it’ll improve", the plan panel’s deputy chairman, Montek Singh Ahluwalia, told reporters. The economy grew by 8.5% in 2010-11 and, according to the RBI’s projection, the growth rate in FY12 would slow down to 7.6%. The rupee continues to face further depreciation threats on the back of a gaping current account deficit and slowing growth. The worst performer among its Asian peers, the rupee has lost 6.7% during the month, taking its fall so far in 2011 to 14.37%. On Wednesday, the rupee closed at 52.20/21 per dollar, 0.35% weaker than Tuesday's close, recovering from the day's low of 52.42 after China cut its banks' reserve requirement ratio by 50 basis points, which aided global risk appetite. As Telecom Minister Kapil Sibal held a meeting with the top bosses of the telecom operators here on Wednesday, reports suggested with some of the telecom firms opposing such pacts the industry is divided on the issue. However, the government continues to insist such pacts were in clear violation of the 3G licence norms. The country’s top three telecom operators — Bharti Airtel, Idea and Vodafone — had also written a letter to Prime Minister Manmohan Singh seeking his intervention in the dispute, suggesting even the surrender of spectrum and return of their money in case the issue has not been resolved. While today’s meeting was reportedly cordial, some of the operators asked the government to come out with a new framework on the issue. Those who met Sibal included Sunil Mittal of Bharti Airtel, Anil Ambani of RCom and Vittorio Colao of Vodafone. According to reports, there was no unanimity in the industry over the contentious issue which has been termed as violation of licence norms, both by DoT and the Telecom Regulatory Authority of India. According to officials the chiefs of the telecom firms also discussed another contentious issue — spectrum pricing — and TRAI's recommendations on merger and acquisitions. On Tuesday Sibal had pointed out the decisions related to issues such as 3G roaming would be made only after discussions with the industry and in accordance with the law. Recently, the three big GSM operators — Airtel, Vodafone and Idea Cellular — entered into a pact for providing 3G roaming network on a pan-India basis. This was necessitated as none of the 14 operators in the country won a pan-India licence during the auction held last year. By this network sharing pact the operators were able to provide a seamless 3G roaming to its subscribers. If their averments made before the Appellate Tribunal for Foreign Exchange were correct, then they “must be in a state of begging, which not even a man of ordinary prudence will be prepared to accept,” a bench comprising justices GS Singhvi and SJ Mukhopadhaya observed in a verdict while dismissing their appeals on Tuesday. It was clear they “deliberately concealed the facts relating to their financial condition. Therefore the appellate tribunal did not commit any error by refusing to entertain their prayer for total exemption,” the bench held. “It was their duty to candidly disclose all their assets, movable and immovable, including those in respect of which orders of attachment may have been passed by the judicial and quasi judicial forums. Instead of coming clean, they tried to paint a gloomy picture about their financial position, which the appellate tribunal rightly refused to accept,” the court noted. The ED special director , Mumbai, had passed an order on January 30, 2006 imposing a penalty of Rs 80 crore on Ketan and Rs 12 crore on Kartik for doing financial transactions in violation of the Foreign Exchange Management Act, 1999. Speaking on the sidelines of Tokyo Motor Show here, he said: "The (Indian) market is asking for more diesel engine cars and we’re fully aware of that." He added as far as India was concerned, the company's focus will be on the compact car segment to drive volumes. "We had developed Brio (compact car) for India, Since we see limited opportunities for large size vehicles, our emphasis is on small compact cars for India," he added. Asked about the prospects of the Indian market, Arai said: "At this point Japan, the US and China are the three biggest markets (for Honda). In my opinion India is the top growth market and I believe India will soon overtake China. Definitely India will be our emphasis." On the issue of local sourcing for parts, he said weakening of rupee against the dollar has had an impact. "We’re trying to locally procure parts in India and also assemble there. As of now, 80 per cent of our products are localised. We still want to increase it," Arai said. Looking to be the largest selling luxury car in the country, Audi India , having already got its sales outlets in Chandigarh and in Ludhiana , is looking to open two more outlets in Amritsar and Jalandhar over the next year. Talking to The Tribune, Audi India managing director Michael Perschke said Punjab was on the top of the radar for Audi India with a large number of youngsters looking at possessing an Audi. He claimed Audi was one of the most popular cars in the state with SUVs selling very well. He said while a lot of groundwork had been done by its competition in the state over the past few years, having now got a foothold in Punjab Audi India would be looking to not only catch up with its competitors but also aiming at overtaking them and become the no 1 in the market. “Audi’s entry into Punjab was having a ripoff effect and more people were looking at owning an Audi rather than another luxury car, the market for which is growing by the year”, Perschke added. While two years ago the market for luxury cars was 0.5 per cent, it jumped to 0.7 per cent last year. The luxury car manufacturers point out with growing disposable incomes the high-end car market is expected to cross the one per cent mark this year. Acer India’s market share in the PC segment dropped from 12.65% between April and June this year, to 11.15% between July-September. To regain its lost ground, the company will also focus on increasing its business in the consumer business. Talking to The Tribune, Acer India chief sales officer Harish Kohli, who is set to take over as MD next month, said the company had a base in 700 cities when it launched the Outreach Programme earlier this year. “By the end of this year we’ll be present in 1,000 other towns,” he said. He added consumer business accounted for almost 53% of the firm’s total business. “But the major growth will come from the government business. With banks being asked to expand their branch rural network and their automation going on, we’re expecting an upsurge in business for our desktops. The education sector, which now accounts for 20% of the firm’s total business, will help us grow. As a result, we’re eyeing 25% growth (in value terms) this year and 30% growth in 2012,” he said. Kohli added the weakening rupee had hit the firm hard since it was importing most of the hardware from its facilities in Taiwan and only assembling it in Pondicherry. With the demand of diesel cars very high in India, the company said it is also lining up more diesel engine cars for the country. "It’s under consideration to launch electric vehicles in India," Suzuki Motor Corp representative director & executive VP & GM (corporate planning office) Toshihiro Suzuki told PTI on the sidelines of Tokyo Motor Show. No financial details, however, were disclosed. Under the agreement, the IT firm will provide centralized statistical programming, statistical analysis, medical writing, and document publishing services across the entire chain of clinical data reporting from case report forms to clinical study reports, Cognizant said in a statement.